ISON made its closest approach to the Sun during the evening of 28 November, passing just 1.2 million kilometres from the Sun's visible surface. At first the comet was thought to have disintegrated during its fiery encounter, with just a remnant of its tail continuing along ISON's trajectory. But, the next day, it seemed clear that something had survived after all -- possibly a small chunk of ISON's nucleus, along with a lot of dust. This progressively faded as it edged towards SOHO's field of view on 30 November. Over the coming weeks scientists will be analysing the data collected during ISON's encounter with the Sun to decipher the nail-biting chain of events that took place. 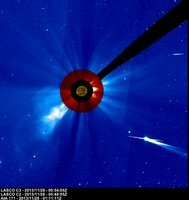 27-Nov-13 23:01 UT - Multiple movies from NASA GSFC: NASA's Solar Observing Fleet Watch Comet ISON's Journey Around the Sun and a story from the NASA homepage Comet ISON Streams Toward the Sun. 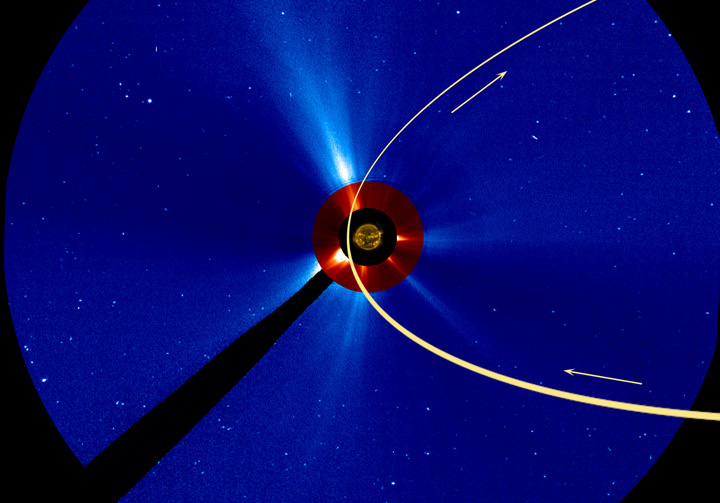 Now that we have observations of the comet in the NASA STEREO instruments and, more recently, the ESA/NASA SOHO LASCO C3 instrument, CIOC team member Matthew Knight has been able to start recording photometry of the comet. His results seem to imply that the comet may have experienced an outburst during the (approximate) period Nov 21 - 23 with corresponding brightness increase, followed by a leveling off and then dropping back down to "pre-outburst" levels. Since entering the LASCO C3 field of view, comet ISON has increased by at least a factor of four, and indications are it may be closer to a factor of ten. In the most recently available images, the comet appears to be around magnitude +0.5. It is now the opinion of the CIOC Team that Comet ISON is now behaving like a sungrazing comet. We can not comment on whether the nucleus is in tact or not, but our analyses indicate that its rate of brightening is directly in line with that we have experienced with other sungrazing comets. This has no implication on its chances of survival. We strongly encourage all professional solar observatories who have plans in place for observing the comet, to please do so, and the teams should plan for an object brighter than negative one magnitude (and we are being conservative on this estimate). Today's tl;dr is somewhat upbeat: we don't know if ISON will survive, and we won't know until it either does it or vaporizes. But the comet is still "alive" and brightening dramatically in accordance with the behavior we expect of sungrazers. Professional observers with solar telescopes should plan for a negative magnitude object, and we urge observation from these facilities. 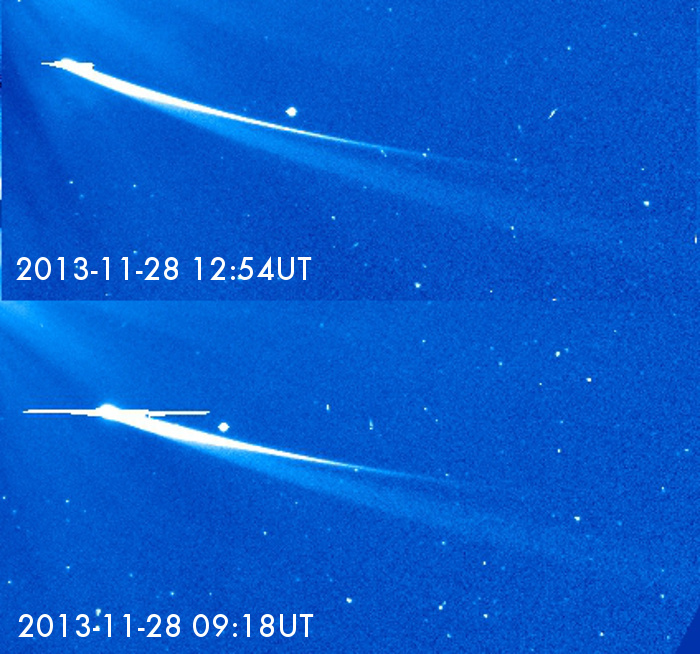 27-Nov-13 02:19 UT - ISON now visible by SOHO! 26-Nov-13 21:19 UT - ISON as seen by STEREO. JPEG and Hi-res TIF images. QT Large (14M), QT Small (2.1M) and MP4 (5.8M) movies. ISON is expected to enter the LASCO C3 field-of-view at 2:00 UT on Wed, 11/27, and the C2 field-of-view at 13:00 UT on Thu, 11/28. ISON is expected to leave the C2 field-of-view at 23:00 UT on Thu, 11/28, and the C3 field-of-view at 23:00 UT on Sat, 11/30. Comet C/2012 S1 was discovered in September 2012 by Russian astronomers Vitali Nevski and Artyom Novichonok using data from the International Scientific Optical Network (ISON). For that reason, it is also known as Comet ISON. This comet is on a close encounter with the Sun on November 28, 2013 (Thanksgiving day in the U.S.), when it will pass at a distance of only 2.7 solar radii from the center of the Sun. Since Comet ISON was discovered so far out, beyond the orbit of Jupiter, and will pass so close to the Sun, many think that this could turn out to be a major comet. A number of solar missions, including SOHO, are planning an observing campaign to observe the comet as it passes by the Sun. 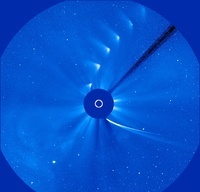 SOHO's LASCO C2 and C3 coronagraphs are expected to have a view of the comet as it passes through their fields-of-view, as shown below. From SOHO's viewpoint the comet enters from the lower right early on November 27 and exits towards the top near the end of November 30. The trajectory information on this page are based on preliminary estimates of Comet ISON's orbit. As more observations of the comet are collected, these orbital estimates will be improved over time. The Comet ISON Observing Campaign from NASA. Movie of the expected trajectory from the STEREO spacecraft. The orbit of Comet ISON using the 3D Java orbit tool provided by STEREO's SECCHI team. NASA News Release: Comet of the Century? (18 January, 2013).